Dr. Jane Buxton receives a gift from the BC Harm Reduction Strategies and Services Committee to congratulate her on receiving the recent Provincial Health Officer’s Award. On April 1, 2012, the provincial Harm Reduction committee launched Toward the Heart, a website serving as an online portal for the latest harm reduction information in BC. This includes current news and alerts, a catalogue of supplies, links to BC guidelines, training materials, local research and more. We also set up an email list and Facebook and Twitter channels to facilitate a two-way knowledge exchange with our stakeholders. Please continue to give us feedback and share our posts. In July, we sent out our first e-Zine issue noting that 78% of randomly surveyed British Columbians supported harm reduction activities in their communities. An almost unanimous 96% agree that drug and alcohol addiction is an important public health issue. A year later, we still find this high level of support very encouraging and continue to look for new ways to engage meaningfully around harm reduction. In this issue, we update you on harm reduction supplies and their distribution across provincial health authorities. In 2012, the BC Harm Reduction Program distributed almost 7 million needles/syringes, an increase of over a million from the year before. We check in on the Take Home Naloxone pilot program nine months after kick-off and are pleased to announce that 14 overdose reversals have been reported in the first nine months. We also have some new information on our research projects, catching up with our youth co-researchers work on the Youth Injection Prevention (YIP) project and announcing the next annual drug survey with harm reduction clients. Thank you for your continued support. We look forward to another great year empowering individuals, families and communities to be safer and healthier. This data suggests that when developing online resources, there are regional access patterns that must be considered to reach specific audiences. We hope to continue improving the website experience for all visitors. Thank you to Michaela Montaner for her help in analyzing our communication strategy. Jane would like to thank everyone who has contributed this past year to the success of the program. Congratulations one and all! 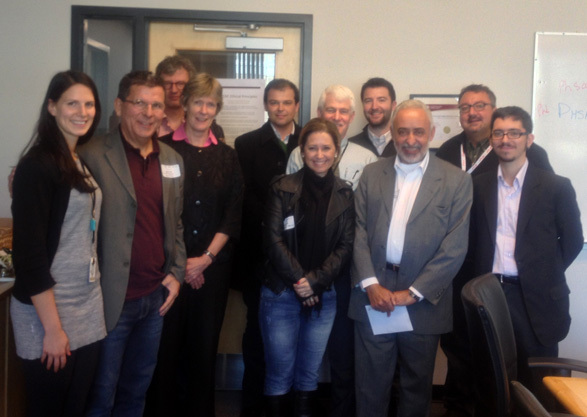 In April, we enjoyed a visit with Brazilian delegates who wanted to learn more about BC’s Harm Reduction Program.